In the winter of 1985, I saw a little Cape Cod house clinging to a bulldozed slope - and fell in love. Logically it didn't make sense. The fifty-year-old house was a disaster. The paint was scaling, the mechanicals were hopeless, and what I saw as a romantic Wind-in-the-Willows, Through-the-Looking-Glass retreat, was in fact, a rough fixer-upper, rooted in hard pan, standing up to it's window wells in freezing rainwater. No problem. I squinted at the sun and saw that it would travel from the eastern hill behind the house, along the southern border of the little acre-and-a-half plot before setting in a long, glowing sigh across the valley to the west. I could have roses. I imagined that the spring in the foreground could become a pond, that the giant spruce trees would add elegance and winter color, that after trucking in a few million yards of topsoil, I could realize my dream garden. I ran quickly through the house with my eyes closed, signed the contract and named my little estate Broccoli Hall. In the beginning, I worked with reknowned horticulturalist, Tim Steinhoff, who helped me understand garden structure and interpreted my colorful ideas into actual plants. 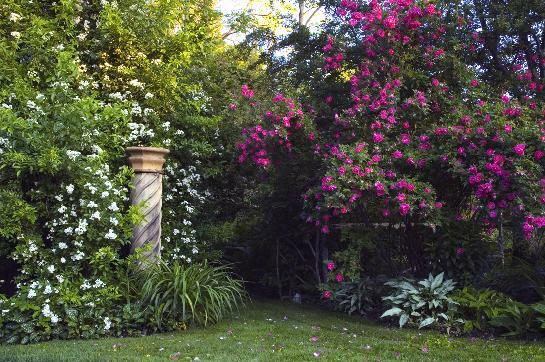 Thirty-one years have passed, and in that time I've had failures and unexpected successes, learned that "perennial" doesn't mean "eternal" and that good structure makes the garden satisfying in all seasons. 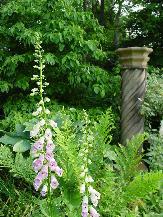 Most of all, I've learned to love what grows best in my garden. Above, my dream house and garden in 1985. I dreamed big! Today... 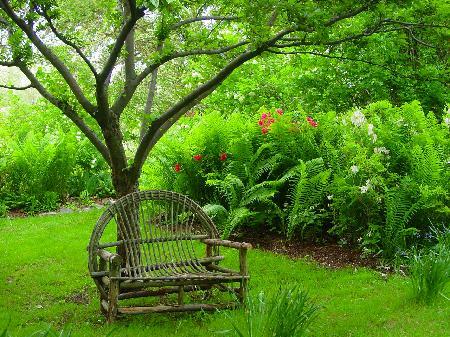 Broccoli Hall is a private garden in Amenia, New York, that is open to the public twice a year. Inspired by English gardens, Broccoli Hall is a series of connected garden rooms, each differing in mood and content. 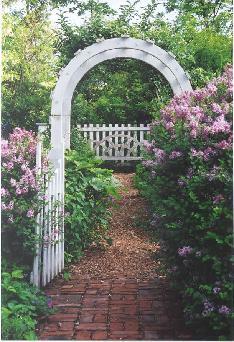 Visitors say that the features they like best are the boxwood-lined cottage garden with an apple tunnel, the brick courtyard, the secret woodland garden blooming with crabapples and white-and-pink daffodils in May, the abundant three hundred foot long June border with roses, peonies and tall bearded irises, the koi ponds and the pink, five-sided treehouse with long views of distant hills. If you have QUESTIONS OR COMMENTS about Broccoli Hall, please write to us at BroccoliHall@aol.com. Maxine Paetro is a gardener, wife to John Duffy, stepmom to Brendan, cat mom to three, koi breeder, co-author with James Patterson. http://en.wikipedia.org/wiki/Maxine_Paetro The 17th Suspect, our latest entry in the Women's Murder Club series, was published on April 30, 2018. The 16th Seduction and a Bookshot (novelette) "The Medical Examiner," came out in May and July 2017, respectively, and a new stand-alone novel "Woman of God," was published in October 2016. The 18th and 19th Women's Murder Club thrillers are in the works and will be published next year. I appreciate hearing from garden visitors who are fans of the Women's Murder Club! 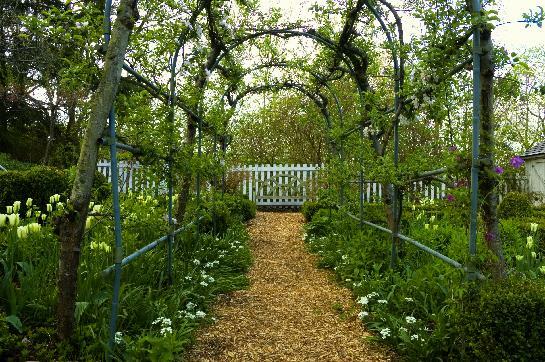 The arbor leading from the courtyard to the cottage garden. early Spring, a stream of daffodils to the pond. 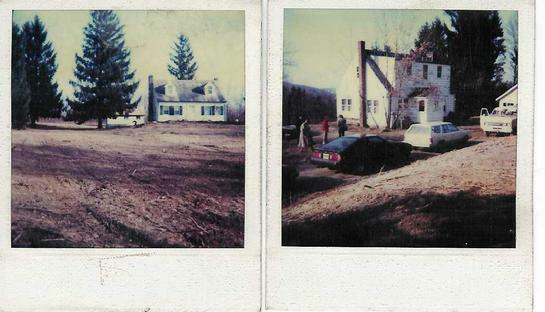 Photographer, Jennifer May, took most of the photos you've seen here of Broccoli Hall. To see her portfolio of work and more pictures of BH, please click on this link: http://jennifermay.com/maxine-paetro/broccoli-hall.html. In 2009, a new venture was started at Broccoli Hall; the Ki Shusui project. 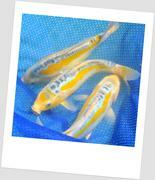 The "elusive Ki Shusui" is a variety of koi that is difficult to breed and hard to find. In 2012, we (the fish and I) had a successful spawn and a few of these lovely young ki shusui koi are living in one of the three mud ponds in the garden. Unfortunately, fish are hard to see in mud ponds in summer. But, we will do a few feedings in hopes of making visual contact. And, if you click on this link, you will connect with kishusui.com and can see images of this adorable fish. www.kishusui.com. There is a video link at the bottom of this page that will require you to copy and paste into your browser. There will be an Open Day on May 12 and in June 16, 2018.